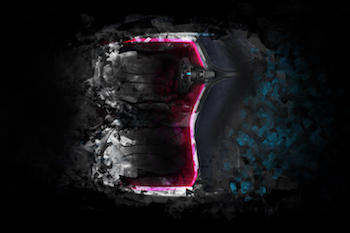 Pininfarina will show a full-scale mock-up of its forthcoming luxury electric supercar, dubbed “PF0”, to prospective buyers during Pebble Beach this coming weekend as this dramatic project begins the countdown to its premier at the Geneva Motor Show next year. “Numerous design icons from Pininfarina’s incredible history have won awards at Pebble Beach Concours d’Elegance, so I am excited to present a future Pininfarina classic to prospective owners in close proximity to this famous event,” said Michael Perschke, Automobili Pininfarina CEO. “But our time at the Pebble Beach Concours d'Elegance and in the Monterey auction houses will also be a highlight,” he continued. "We will celebrate Pininfarina's unique place in automotive history and undoubtedly pick up further inspiration for our future range of cars from these Italian masterpieces." The design of the PF0 is being developed by the Pininfarina Design Studio, and the PF0 will be hand-crafted in-house in Cambiano in very limited numbers from 2020. It will be priced at between US$2-2.5 million. 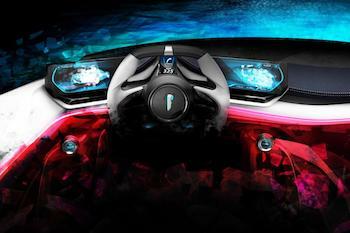 In recent days Pininfarina has revealed sketches of the interior showing a very minimalist layout, there are just two buttons visible on the dashboard, the one on the left offers driving modes while the one of the right is for gear selection, with the steering wheel appearing to house further control buttons. There are slim LCD screens on either side of the driver, obligatory for an electric car of this generation, and the dash is trimmed in carbon fibre. “Our objective with the exterior of PF0 is to design timeless beauty in every aspect, and the interior is equally important,” said Borgogno. “Pininfarina’s design values of elegance and simplicity present us with a fantastic opportunity to stand out from the styling of most current sports and hypercars. PF0 is in the final stages of design and the company say it’s been inspired by famous Pininfarina cars such as the Cisitalia, Modulo and Sintesi. Each was ahead of its time when presented and Pininfarina reckons that future PF0 owners – no more than 150 worldwide – are guaranteed the same approach and results, inside and out. 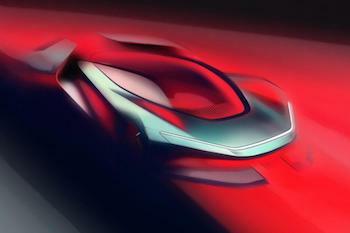 It will be created from carbon fibre, and high levels of technology and functional design lie at the heart of the PF0 which will deliver a staggering performance for a road car: a stated ambition to accelerate to 62 mph in less than two seconds, break the 250 mph top speed barrier, and provide a potential zero-emissions range of over 300 miles. Automobili Pininfarina has been on a recruitment drive in recent months to support the project and incoming senior management include Per Svantesson (Chief Operating Officer) who has a background at Volvo, Valeo and ESAB; Dan Connell (Chief Brand Officer) arrives from Jaguar Land Rover; Marcus Korbach (Sales Director) joins from Bugatti and Paolo Dellacha (Product and Platform Director) has nearly two decades in computer-aided engineering, specifically, testing, engineering and design roles at Ferrari, Maserati and Alfa Romeo. Joining Pininfarina and guests in California this week to mark the occasion of the concept preview will be Anand Mahindra, Chairman of Mahindra & Mahindra, whose rescue and on-going support of Pininfarina has opened up the opportunity for the arrival of Pininfarina-branded luxury cars. Paolo Pininfarina, Pininfarina SpA Chairman and grandson of the famous styling house's founder, Battista 'Pinin' Farina, added: "Our American dream was established in the 1920s even before the company was formed. My grandfather, Battista, visited Ford and at the end of his tour had lunch with Henry Ford who asked him to become their chief stylist. But he had other ideas and the rest is automotive history." Borgogno's role in defining the PF0 design brief follows his appointment as Automobili Pininfarina's Design Director earlier this year after fourteen years as one of the lead automotive designers at the company. Having worked together for many years, Borgogno and Bonzanigo will channel almost 90 years of Pininfarina's design expertise into the styling and creation of all Automobili Pininfarina's cars. The final PF0 design will be passed to the Pininfarina Atelier team in Cambiano who will hand build the car. Borgogno's vision for every future Automobili Pininfarina car takes inspiration from his favourite Pininfarina cars including the 1947 Cisitalia 202, the 1970 512S Modulo, and the 2008 hydrogen fuel-cell powered shooting brake concept Sintesi. He has clear goals in mind for Automobili Pininfarina cars to be elegant, clean and pure in surfaces and volumes, and which, as a whole, present objects of beauty with hints at innovation, technology and speed.